Did you know that over 50 million Americans suffer from allergies each year? And many of these people are stuck dealing with a dry, puffy mess called eye allergies. Starting in the Spring, eye allergies can often mean an itchy and red year for those who have to deal with them. If you’re one of these people, you know how frustrating it is to deal with eye allergies. Eye drops, doctor visits, and sometimes even medication can take time and energy out of you. Knowing a bit more about the allergy, cures, and symptoms will give you an upper leg when you’re trying to defeat your allergies this year. This article will tell you everything you need to know. For some, eye allergies, also known as allergic conjunctivitis, don’t start developing until later in life. This is because our immune systems eventually start to recognize a new substance, called an allergen, as harmful. Often, this is something simple like pollen or dust. The symptoms are usually pretty obvious, meaning you won’t need an optometrist’s help to diagnose this. But you should talk to them for help if you have any questions or severe pain, but we’ll get to that later. Keep in mind that these symptoms don’t always mean you have allergies. Other factors could be causing any one of these symptoms, but a combination of them all could mean you have eye allergies. Your eye doctor will be able to diagnose your symptoms. Often, pink eye and similar diseases can look like eye allergies, so getting their opinion may help you catch other issues before they become serious problems. Now that you know whether or not you have these allergies, let’s move on the deeper side: what causes eye allergies? Although it’s interesting, you might be wondering why you need to know this. For one, knowing what causes your symptoms will help you to avoid allergens you come across in your daily life. Eye drops and artificial tears can cause some people to have an allergic reaction. 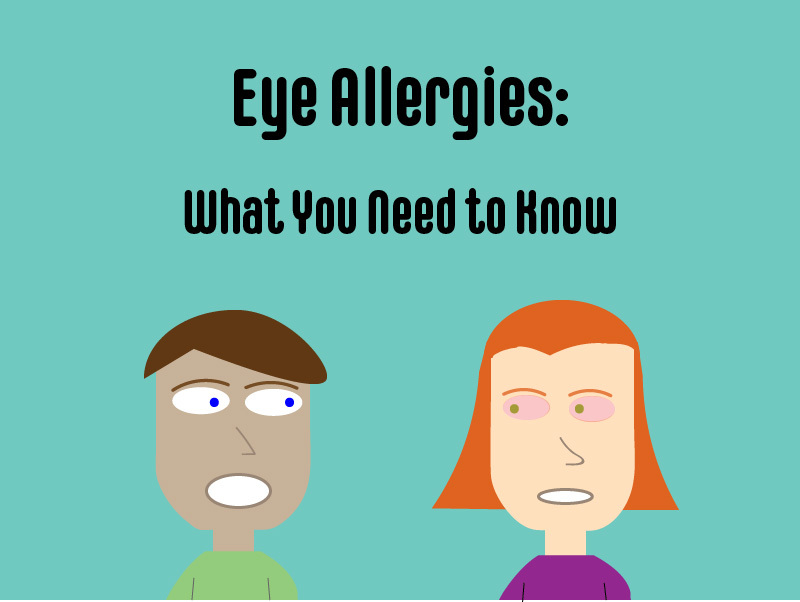 Usually, food and other common allergens will not cause people to display symptoms of eye allergies. That doesn’t mean it’s impossible though. One person’s allergens won’t always be the same as someone else’s. If you don’t have allergies yet, you still might develop them over time. Allergies tend to run in families, so be ready to have them if your relatives do! This also means parents with eye allergies should be extra careful with their children. There’s no denying that eye allergies are anything but fun, and if you’ve made it this far, chances are you’re looking for relief. Let’s discuss how you can find just that. For people that wear contacts, one of the best ways to reduce your symptoms is by taking out your contacts. If an allergen gets stuck in your eye without you noticing, you might find yourself itching all day. If allergies get too bad, you might want to think about wearing glasses instead of contacts during high allergy seasons. At the very least, make sure to keep contact solution and a spare pair of glasses with you when you can. For those already wearing glasses, consider wearing wrap-around glasses to shield your eyes during allergy season. If you can’t give up contacts, there are also wrap-around sunglasses you could take outdoors. One common defense against eye allergies is non-prescribed eye drops and artificial tears. This simple yet effective solution to allergies is how most people beat them each year. Follow the instructions on the bottle of eye drops you choose. Each has different rules, and consider asking your eye doctor which one to use. In some severe cases, an optometrist can prescribe prescription medications for your allergies. This is only after other cures don’t work. Antihistamines, prescription eye drops, and steroids may all help in the fight against eye allergies. Ask your eye doctor on your next annual visit for advice on this. Seeing an eye doctor for your allergies isn’t uncommon at all. Even if you feel like it’s not a huge problem, talking to your optometrist may bring you some relief. You should see your eye doctor for your allergies if the pain is becoming distracting. Stinging or redness isn’t uncommon, but it may be a bad sign if it lasts too long or hurts extensively. Light sensitivity isn’t uncommon with eye allergies either. Although, if you’re having trouble with your day-to-day activities, see your optometrist for help. Thinking about switching to glasses to help with allergies? This won’t be the first time your eye doctor has heard this one. Feel free to schedule an appointment to ask about this. In general, it’s better to be safe than sorry with your eyes. Contact your optometry office if you’re in doubt. As mentioned before, kids with parents that have allergies need to be on high alert for any allergens. In fact, all parents should have some concern with these allergies. One in ten children has already developed eye allergies. Of course, a lot of the signs of eye allergies are pretty obvious, but you might want to get an optometrist’s opinion to confirm it’s what you think it is. One thing to note with kids is that they may scratch at their eyes because of their allergies. Scratching can cause serious damage to their eyes, so if they show symptoms, make sure to find a cure for them quickly. Ready to Beat Those Eye Allergies? Now that you’ve read this article, you should be ready to go to bat against eye allergies. Remember that every case is different, and you should speak to your optometrist if you have any questions. Over the next few weeks, we’ll be taking a deep dive into eye allergies. So to stay in touch, make sure to follow us on Instagram, Twitter, and Facebook. Want to speak to one of our eye doctors or make your annual appointment? With six locations, you can schedule your next Knoxville eye exam here.